Surface Forces and Nanorheology of Molecularly Thin Films. Marina Ruths and Jacob N. Israelachvili, in Handbook of Nanotechnology, 3rd edition, Chapter 29, B. Bhushan, Ed., Springer-Verlag. (2010) 857-922. Surface Forces and Viscosity of Water Measured Between Silica Sheets. R.G Horn et al., Chem Phys Lett (1989) 162 404. Thin film rheology and tribology of confined polymer melts: contrasts with bulk properties. G. Luengo, et al., Macromolecules (1997) 30 2482–2494. Triboelectrification between smooth metal surfaces coated with self-assembled monolayers (SAMs). Akbulut, M., A.R.G. Alig, and J. Israelachvili, Journal of Physical Chemistry B (2006) 110 (44) 22271-22278. ​Friction and tribochemical reactions occurring at shearing interfaces of nanothin silver films on various substrates. Akbulut, M., A.R.G. Alig, and J. Israelachvili, Journal of Chemical Physics (2006) 124 (17). ​Amontons’ Law at the molecular level. A. Berman, C. Drummond, J. Israelachvili, Trib. Letters (1998) 4 95–101. 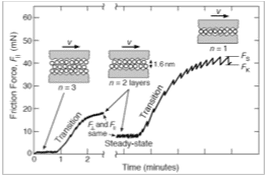 Limit cycles in dynamic adhesion and friction processes: a discussion. H. Zeng et al., J. Adhesion (2006) 82 933-943. High Speed Frictions Measurements Using a Modified Surface Forces Apparatus. D. D. Lowrey, K. Tasaka, J. H. Kindt, X. Banquy, N. Belman, Y. Min, N. S. Pesida, G. Mordukhovich, J. N. Israelachvili. 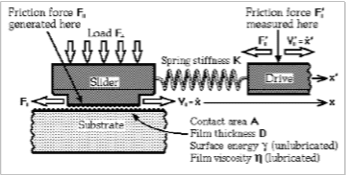 Tribology Letters (2011) 42 117-127. Measurements of anisotropic (off-axis) friction-induced motion Kai Kristiansen, Xavier Banquy, Hongbo Zeng, Eric Charrault, Suzanne Giasson, and Jacob Israelachvili. Adv. Matls. (2012) 24 (38) 5236-5241. On the conformational state of molecules in molecularly thin shearing films. Jacob N. Israelachvili and Carlos Drummond, PNAS 112 (2015) (36) E4973. Time-dependent wetting behavior of PDMS surfaces with bio-inspired, hierarchical structures. Himanshu Mishra, Alex M. Schrader, Dong Woog Lee, Adair Gallo Jr., Szu-Ying Chen, Yair Kaufman, Saurabh Das, and Jacob N. Israelachvili, ACS Applied Materials & Interfaces (2016) 8 (12) 8168–8174. The following values are approximate, and should be calibrated for each instrument and attachment before use as described in the Users Manuals. It is also advisable to recheck some calibrations periodically. This is because some properties, for example, of piezo-electric crystals, can depend not only on the temperature, but also on the humidity, time and usage (aging and previous history effects). Normal distance resolution: 0.1 nm (1 Å). ​Sensitivity of measuring normal and adhesion forces: 10 nN. Maximum compressive pressure previously attained (using curved surfaces of radii 0.52 mm and a thin layer of hard glue): 0.5 GPa (5,000 atm). Thermal drift: < 0.1 Å/sec (after 1 hr equilibration in a room or enclosure that is temperature stabilized to ±0.1℃). Friction spring stiffness: typically 104 N/m = 107 dyn/cm (large range of stiffness available). Range of reciprocating sliding/shearing distance: ±2.5 mm (5 mm peak-to-peak). A special rotating disk substrate now allows for continuous rotational motion. Range of lateral sliding speeds: 10-8 to 1 cm/s (a special high-speed attachment now allows for speeds of >10 m/s. Maximum shear rates attainable: 105 s-1 in squeeze mode (higher rates attainable in shearing/sliding mode depending on the test fluid). Recommended range of driving frequencies: 10-6 to 250 Hz. Resonant frequency of stage (with glass support): approx 300 Hz. Mass of stage (with glass support): approx 2 gm. Maximum recommended applied voltage (peak to peak): ±100 V.
Maximum lateral displacement (at maximum voltage): approx ±50 µm (0.1 mm peak-to-peak). Stiffness of bimorphs: approx 104 N/m. Resonant frequency of bimorphs and support (stage): approx 200 Hz. Mass of support (stage): 8gm. 1 All stainless steel parts of internal surfaces are 316-type non-corrosive, non-magnetic steel. Other internal parts are either silica, PTFE (Teflon) of Kel-F.
2 Much smaller particles trapped between two surfaces can be “detected” due to the much larger deformations they produce on the surrounding surfaces. 3 Values quotes are for semiconductor gauges. Resistance (foil) strain gauges are about 100 times less sensitive (but sturdier and less prone to drift).